The results continue to roll in … and they are shocking. 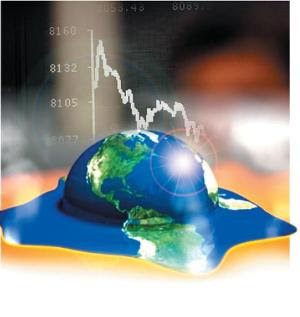 Though some may think that the Global Financial Crisis (GFC) already belongs to the history books, in reality, its fallout is epochal for the world; its development a chapter in the processes leading to the “end of days.” Readers might think this a sensationalist statement. However, by the end of this article, you may want to reconsider. According to a recently released study by two well-known international economists, Carmen Reinhart and Kenneth Rogoff, the impact of the GFC upon global debt levels has been catastrophic. In their research report1, they document that government debt levels for the top-5 crisis countries (the U.S., UK, Ireland, Iceland and Spain) have risen 75% over the last two years. Stop to consider this statistic for a moment. Astoundingly, in the short time-span of only two years, these government debt levels have risen by more than two-thirds. While anyone following global financial affairs during the last few years will not have been surprised by this development, it nonetheless is alarming. Many secular observers would agree. However, we here wish to focus upon the prophetic timeline and an entirely different set of questions. Just why the rapidity? Just how does this trend correlate with the Bible? Does government debt have an endtime role? Taken together with several other trends and a literal scriptural perspective, in our view, it leads to an irrefutable diagnosis. These developments do align with endtime Bible prophecy. Though, of course, we cannot draw any near-term, specific predictions, we would be negligent not to conclude that the world is indeed on the fast track to great troubles “such as never was” (Daniel 12:1). Just what threat to the entire earth would cause policymakers around the globe to plunge into such lunacy? Of what great significance is this development? The news media is full of reports of various committees and hearings in high places, examining the causes of the Global Financial Crisis (GFC). Wall Street bankers and monetary officials have been summoned before special tribunals, which are investigating the massive losses and financial instabilities foisted upon America and the world. Why did it happen? Who can be blamed? One Wall Street banker, Lloyd Blankfein, CEO of Goldman Sachs, appearing before the Financial Crisis Inquiry Commission, even claimed that the GFC was “an act of God.” Only weeks earlier, when being interviewed in London, he commented that he was only a banker “doing God’s work.” Other senior financial executives have also expressed favorable opinions on the morality of their work and their “bulge bracket” companies and incomes. Observing recent intransigent attitudes on Wall Street, it is actually much worse than Galbraith suggests. Said Daniel Fass, organizer for an Obama fundraising dinner from Wall Street at the Mandarin Hotel, “The investment community feels very put-upon. They feel there is no reason why they shouldn’t earn $1 million to $200 million a year, and they don’t want to be held responsible for the global financial meltdown.” And so, only a year after many of these financial firms were saved from certain collapse through government-funded bailouts — actually, by future generations of our children — they are again paying themselves multi-billions in bonuses. To recall, these bailouts were one of the contributing causes to soaring government debt levels. How does such graft and corruption continue unprotested? Past instabilities and mismanagement aside, bankers well understand that they remain in the driver’s seat. How so? This industry sits squarely upon the edifice of “money.” Bankers (meaning any and all who work in financial institutions and are plugged into global financial markets) know well that they will not soon be thrown out of mankind’s secular temple of this present Age of Capital. We live in an era of global convergence in values. The world has agreed to endorse humanist materialism. Fractional reserve banking, wealth in the form of debt, and the notion that human progress is defined by growth in gross domestic product (GDP) make up the unholy trinity of toppling idols that must be propped up and nailed down at all cost. “They adorn it with silver and gold; they fasten it with hammer and nails so it will not totter” (Jeremiah 10:4). The key argument bankers used to bludgeon governments into bailing them out, was the cry that “economies cannot recover if you do not first allow us to recover.” We see that the world has been held hostage by the financial industry. How did this late state of affairs happen? In recent decades, the financial industry became inordinately large, not just in America but worldwide. The affairs of money grew to the point that this sector represented more than a third of all corporate profits. How is it that an industry that contributes so little productive activity should become so profitable and employ so many people? We have documented these epochal developments in previous articles. Franklin D. Roosevelt was to have said, “The money-changers have fled from their high seats in the temple our civilization. We may now restore that temple to the ancient truths.” He made this rather optimistic statement during his First Inaugural Address, in 1933. At that time, America was in the depths of the Great Depression. Wall Street had been chastened, and thousands of banks were closing their doors. Unfortunately, Roosevelt was wrong. He probably did not imagine that the business of money would become many, many times larger relative to human life than during his day. It surely did, and it likely will remain so. The “love of money” reigns rampant today in its advanced state, there being few and fewer restrainers in the world against this force. Corruption runs deep in high places, the world having committed to a materialist “heaven on earth” (denying God), and much of religion has found a comfortable coexistence with this state of affairs. That this is the road to an eventual holocaust for mankind is supported by Christ’s statement, “Man shall not live by bread alone, but by every word that proceedeth out of the mouth of God” (Matthew 4:4). This statement in itself essentially condemns the modern world’s slavish fixation with every nuance and statistic of the fabricated notion of GDP. Debates continue to rage in the academic world of economics as to the causes of the GFC and just what should be done in the future to avoid similar disasters. While we certainly respect the contributions of some of these intellectuals, frankly, the debates border on the comical in some respects. To begin, it is crucial to understand that economics is not a science. It is a philosophy … really, a religion. Seen overall, this economics fraternity proved themselves to be false prophets in the king’s court. In direct contrast to their continuing prophecies of “prosperity as far as the eye could see,” they were proven wrong by the disaster of the GFC. Yet, following this disaster, they remain in their advisory posts at the king’s table. In spirit, it is today the same as it was in the time of Ahab, the wicked king of Israel. He was the infamous founder of the 120-year legacy of the “practices of Ahab’s house” (Micah 6:16), for which God destroyed Israel. To a man, all of his establishment prophets (some four hundred) prophesied victory as he was pondering whether to go to war against Ramoth Gilead. Only one prophet who received his inspiration from God, Micaiah, told the grim truth. For this bravery he was rewarded with a slap in the face (1 Kings 22:24). Ahab then ordered to “Put this fellow in prison and give him nothing but bread and water” (1 Kings 22:27). As then, in many vocations today there is a significant price to be paid for speaking the truth. This can also certainly be true in any public role in economics and finance. For one, any admission of a faith in Jesus Christ virtually guarantees career suicide. Secondly, it hurts the pocketbook. The famous quip by Upton Sinclair is apropos here, “It is difficult to get a man to understand something when his salary depends upon his not understanding it.” The point he makes is that anyone — whether a tenured academic, perhaps a scientist contesting the “global warming” theory…etc. — is censured also economically. They may lose their jobs or have the funding pulled on their research projects…etc., if they do not align with the humanist and globalist agenda. As such, “understanding” can be heavily influenced by money. Despite the fact that the “economics priesthood” has been entirely defrocked as frauds, they are still consulted for solutions to get the world out of the current mess. Of literally hundreds of opinions written by so-called economists on the causes and remedies to the current economic troubles that this writer has read over the past 18 months or so, not one can be recalled that in any way alluded to the unbridled basic nature of man as being the problem. It is the “human condition” of a fallen world. While the God-appointed facility of civil government during this dispensation is surely charged to pursue beneficial and wise policies (Genesis 9:6), temporal solutions must not ignore what is right in the eyes of God in favor of what is right in their own eyes (Isaiah 5:21). The Bible says it is the heart of man that is the issue. “The heart is deceitful above all things and beyond cure. Who can understand it?” (Jeremiah 17:9). Mankind is innately sinful. How then can future financial crises be entirely avoided? Not until the vices of greed and the love of money are eradicated. Until then, “They plot injustice and say, ‘We have devised a perfect plan!’ Surely the mind and heart of man are cunning” (Psalm 64:6). We now return to the topic of government debt. Just how does it figure into endtime developments? Shouldn’t it be strange that government indebtedness plays a role? Isn’t it indebted and trapped individuals who come under the “economic” influence of the False Prophet and the Antichrist? If it is true, as the Proverbs writer says, that “The rich ruleth over the poor, and the borrower is servant to the lender” (22:7, KJV), just how can indebted governments collaborate to rule the world? Actually, with respect to the “money” aspects of last day events, conditions are rather more complex according to the Bible. At least three major impulses can be identified from Bible prophecy, including that of an indebted world rulership. To explain how these conditions interweave, we will describe each of these three roles. 1. A protracted wealth skew. What is meant by a wealth skew? It is the extreme between the wealthy and the poor — the outcome of the wealthy becoming richer and fewer, the relatively poor more so. But is such a condition prophesied? Yes, James specifically prophesies that an amassing of riches plays a role in the endtimes. He says, “Now listen, you rich people […] You have hoarded wealth in the last days” (James 5:1, 3). The King James translation, in this writer’s opinion, translates this condition of amassing wealth more accurately, stating, “Ye have heaped treasure together for the last days” (verse 3). Here, we understand that not only may wealth have increased overall, but it is also “heaped” or “amassed,” as is implied by the Greek word thesaurizo. This is an important distinction, as it gives evidence of a wealth skew. Wealth cannot be heaped and concentrated without there being a deprivation of someone else’s wealth. However, is it reasonable to deduce this endtime condition of an extreme wealth skew from only one single verse? Not only would it be plausible to argue that this verse is clear, but also many other Bible references foreshadow conditions that are in alignment with this condition. From the Old Testament (OT) to the New Testament (NT) prophets, times of extreme commercialism and financial oppression in the last days are outlined. Isaiah and Zechariah point to extreme commercialism, among other OT prophets. In the New Testament, the Apostle Peter warns of “difficult times” that are evidenced by “lovers of money” (2 Timothy 3:1-2). John prophesies in Revelation of the Laodicean church that says, “I am rich; I have acquired wealth and do not need a thing” (Revelation 3:17). This seventh and last church that is admonished is commonly believed to represent the last-day church. In Part 2, we review the other two major players and conclude with the implications for the world. 1) Carmen Reinhart (University of Maryland), Kenneth Rogoff (Harvard University and NBR), “Growth in the Time of Debt,” December 31, 2009. 2) John Kenneth Galbraith, The Great Crash: 1929, 1954, Houghton Mifflin Company, New York.